How do you protect seasonal worksites or temporary storage areas? This is a frequent request of many end-users to their alarm providers, with no easy answer. 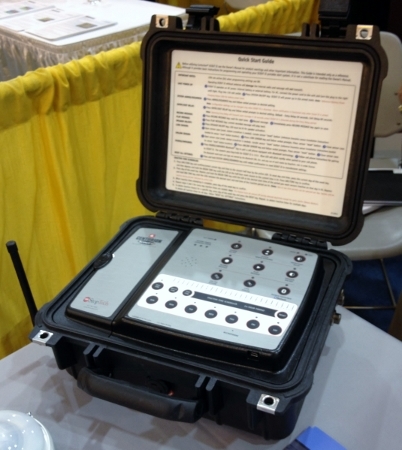 At the recent NRF-LP show, StopTech showed a completely wireless intrusion alarm system. In the following note, we examine the 'Centurion Scout II' and analyse its value proposition. From the start, the system is designed to operate wirelessly, with no cabling needed for power nor communication. Both the alarm panel 'head end' and the compatible alarm sensors are battery powered, however 110 VAC mains power can be used if available. The head end panel provides several methods of notification options - if paired with a mobile phone, the unit can dial any phone number or central station, or a local notification option to key a two-way handheld radio. The alarm message itself is a custome voice-recorded notification up to 20 seconds in length. The all-wireless intrusion alarm system is packaged in a water-resistant, padlockable enclosure. The durability and weather rating of the companion sensors are wholly dependent on sensor designs selected; not all sensors will match the ruggedized construction of the head end unit. This kit could prove to be useful in a variety of applications. For retail applications, this system can be deployed to secure seasonal sales areas or temporary container storage. For the construction industry, this system could be used in job site trailers, tool storage boxes, and material laydown yards. The manufacturer also explains one recent application where Scout II was used to provide an ad-hoc intrusion detection for a vacant 'dark' property, without requiring additional contracted electrical, phone or alarm service. The manufacturer explains that 'Scout II' can be considered for any situation where a intrusion alarm is quickly and temporarily needed. The system uses Inovonics' 'Echo Stream' 900MHz RF technology that forms that basis of many other 'wireless' monitoring technologies. The same platform is licensed for use in nursecall systems, perimeter detection sensors, and other intrusion alarm technologies. While some risk of unreliable communication with endpoints is always present when using wireless transmission, 'Echo Steam' has proven to be very reliable employed in this type of system. Assuming an average deployment of the 'Scout II' with 10 sensors (with an average cost of $45), the system cost will exceed $3000 USD, before considering the cost of batteries and monitoring. If an existing intrusion panel is nearby, this price significantly exceeds the cost of simply installing a typical wireless 'zone expander' and using the same wireless sensors, approximating a cost of $600. The main cost driver for the system, and the fundamental difference it offers compared to expanding an existing system, is the ruggedized 'head end' unit. The additional cost of this unit raises system price 5 times compared to using zone expanders. However, the wireless, battery powered design means that can be used in areas where no electricity, much less existing intrusion systems are deployed, which is an unique advantage of 'Scout II'. While other 'quick deployment' intrusion systems exist, none are designed with ruggedized, stand-alone head-end that 'Scout II' offers.